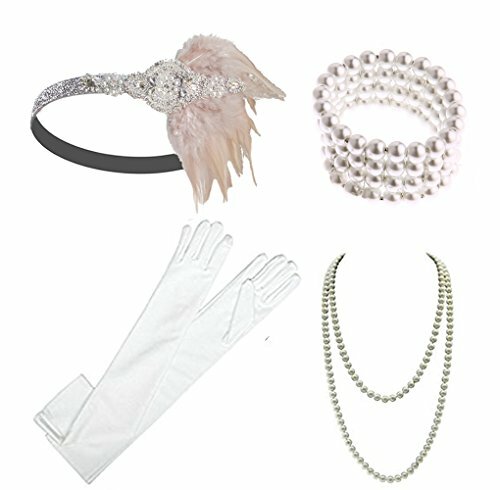 1920s Gatsby Accessories Flapper Headband Necklace Gloves Cigarette Holder Flapper Costume Accessories Set for Women and Girls (EG) | What Should I Say? One pair 22" Satin Gloves( not the cheap material）: Unique vintage With a simple long length for any occassion.and you'll feel like graceful refinement all evening. One 59" Pearl Necklace:Timeless classic style,knotted in between each pearl,it's weighty and not cheap plastic,you can wear in any occasion,also in daily life.